The buyer of a call option expects the price of the underlying share to rise, causing the option premium to rise with it, so that he can recoup the premium paid along with some profit. The maximum amount he risks losing is the premium paid. 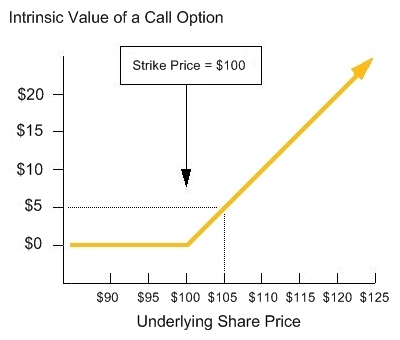 If the underlying share price is higher than a call option strike price, the option has intrinsic value. The option is said to be “in the money”. It has value because the option could be exercised to buy the share at the strike price, which is cheaper than the market price. The intrinsic value is the difference between the strike price and the market price. “market price” – “strike price” = $105 – $100 = $5. The option would allow the holder to buy the $105 share for only $100. Alternatively, he could sell that option for $5 to someone else who might want to take delivery of the stock. The buyer of a put option expects the underlying share price to fall. Remember that the holder of a put option has the right but not the obligation to sell the underlying share at the strike price. That means that the intrinsic value of a put option increases as the underlying share price falls. If the market price is below the strike price, the option has intrinsic value, because the holder can exercise the option to sell his shares at the strike price, which would be higher than the market price. 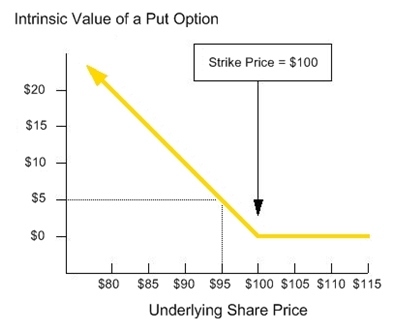 The intrinsic value of a put option is simply the “strike price” less the “market price”. This is the opposite to a call option. Consider US Steel again. This time we’ll look at a $100 put option. If the market price of US steel were $105 the $100 put would have no intrinsic value. At expiry no rational person would sell their US Steel shares for $100 if they could get $105 on the market. On the other hand, if the market price fell to $95, the $100 put option would be worth “strike” – “market” = $100 – $95 = $5. The put holder would be able to sell the share to the put writer at the $100 strike price, $5 above the $95 market price. Alternatively he could sell that put option for $5 to someone else who might want to offload that stock.